Surprise: Zoë Kravitz is engaged! The Big Little Lies actress confirmed the news for the first time in her new Rolling Stone cover story, which was released today. In fact, she's been engaged to actor Karl Glusman since earlier this year and has even been wearing her engagement ring for months without anyone noticing. How sneaky is that? When Rolling Stone reporter Josh Eels asked her about her ring, Kravitz revealed why she had never spoken about the news. "I haven't told anyone yet—I mean, I haven't told the world. I wanted to keep it private," she told the magazine. Kravitz even wore the ring on the Met Gala red carpet back in May, so she was hardly hiding the pretty bauble. Her ring was procured by antique jewelry company The One I Love in New York City. The store told Who What Wear that the ring is a Georgian Half Loop antique rose cut diamond ring from circa 1800, boasting over 2.5 carats of rose cut diamonds collet-set in silver-topped gold. 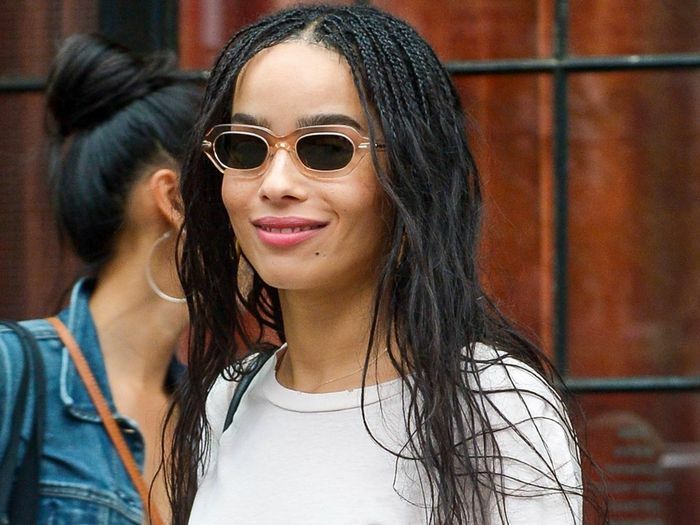 Scroll down to get a close-up look at Zoë Kravitz's secret engagement ring. Next up, shop every outfit Meghan Markle has worn in Australia, Fiji, Tonga, and New Zealand.